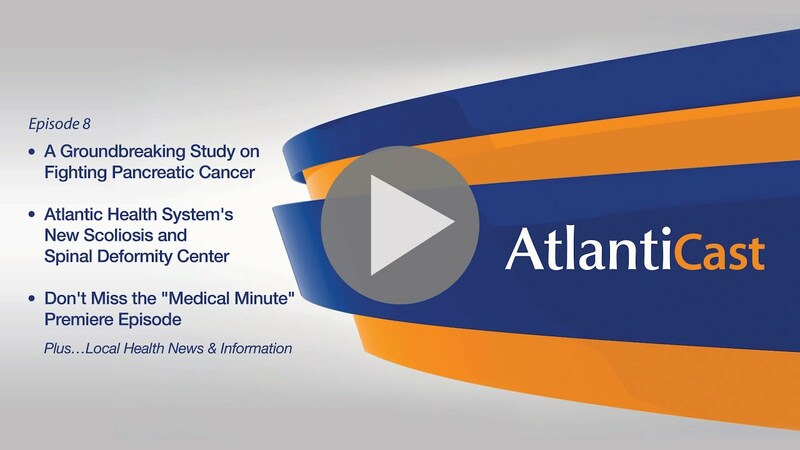 On this week’s AtlantiCast, you’ll learn about a groundbreaking new clinical trial in the fight against pancreatic cancer, meet an award-winning child neurologist at Goryeb Children’s Hospital and hear about the new Scoliosis and Spinal Deformity Center at Atlantic Orthopedic Institute – plus much more! diversity in Atlantic Health System and much more. in a story you first saw on AtlantiCast in September. of GI Medical Oncology at Morristown Medical Center. these cancer cells get the energy that allows them to grow. inspired the current new trial. signs of pancreatic cancer, go to AtlantiCast.org. at the new Scoliosis and Spinal Deformity Center. by US News and World Report as a best in nation program. and Developmental Medicine at Goryeb Children's Hospital. the highest recognition from the Child Neurology Society. contributions to the field of child neurology. headache and migraine, and muscle and nerve diseases. soccer star to couch potato, it's strange. When she suddenly can't breathe, it's terrifying. condition called granulomatosis with polyangiitis. has since recovered and started college this fall. need so much of it to get through a terrible illness. A copy of the article is linked to at AtlantiCast.org. according to Great Place to Work and Fortune magazine. from Great Place to Work and Fortune this year alone. who filled out the annual engagement survey. a leading hospital safety rating organization. other hospitals across the entire country to win this honor. by the American Nurses Credentialing Center. they will get the highest standard of care. Center on earning this distinction. to live the fullest life possible. replaced at Morristown Medical Center. commercial coming soon to a TV near you. at some great events comin' your way. the candy corn's making way for peppermints. Yes, the holiday season is upon us. Anesthesia Associates and Hackettstown Radiology. for the kids and, of course, Santa. Enjoy, and we'll see you after a quick break. Welcome to the AtlantiCast Medical Minute. for a potentially silent killer known as aortic stenosis. Doctor, tell us a little bit about the study. when they develop symptoms or cardiac damage. of symptom will result in benefit for the patients. - And why do it here at Morristown Medical Center? in the treatment of these patients. - Dr. Philippe Genereux, thank you so much. you can check out AtlantiCast.org.